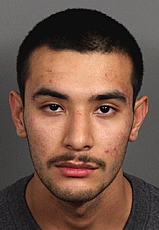 01/22/2016 — Riverside County Sheriff’s Department reports that on January 18, 2016, at 2:49 a.m., a La Quinta police officer located a blue 2007 Hyundai Elantra stopped in the roadway on Avenida Martinez. The officer pulled behind the vehicle and went to make contact with the driver. The vehicle suddenly accelerated away at a high rate of speed in an attempt to evade the officer. The officer ran back to his vehicle and attempted to catch up to the vehicle which lost control and collided with a fence and shrubbery at Avenida Martinez and Calle Sonora. The driver later identified as Richard Jacob Hardin, 20, of La Quinta, fled the area on foot. It was determined the vehicle was registered to an address on Avenida Obregon and the driver was located a short time later at that address. The driver, Richard Hardin, was determined to be under the influence of alcohol/and or drugs, and was arrested. He was taken to a local hospital for medical clearance and was then booked into the Riverside County Jail in Indio for driving under the influence and hit and run. The La Quinta Police Department reminds people not to drink and drive and to call 911 to report drunk drivers. This entry was posted in DWI arrest photos, Hit and run DUI DWI drivers, injury or death and tagged Avenida Martinez, California Highway Patrol, Coachella Police Department, Driving Under the Influence, driving while impaired, driving while intoxicated, drunk driving, DUI, DWI, La Quinta Police Department, Richard Jacob Hardin DUI hit and run, Riverside County Jail, Riverside County Sheriff's Department. Bookmark the permalink.